LAST WEEK — Eagles lost to Cowboys 27-20; Saints beat Bengals 51-14. STREAKS, STATS AND NOTES — Eagles coach Doug Pederson played QB for I-AA Northeast Louisiana from 1987-90. Pederson’s alma mater since renamed Louisiana-Monroe and now in FBS Sun Belt Conference. … Eagles QB Carson Wentz has passer rating better than 100 in franchise-record five consecutive games. Wentz has completed at least 70 percent of passes in team-record four straight. Wentz has thrown multiple TDs in six straight. … TE Zach Ertz has 75 catches for 789 yards and five TDs. Ertz on pace to break TE single-season records for catches, held by Jason Witten with 110, and yards receiving, owned by Rob Gronkowski with 1,327. … WR Alshon Jeffery has 14 receptions for 296 yards, two TDs in two games vs. Saints. … WR Golden Tate only had two catches for 19 yards in Eagles debut last week. … DE Michael Bennett leads Eagles with 5 1/2 sacks, all in past six games. … DT Fletcher Cox set career highs with three sacks and two forced fumbles in last meeting with Saints. … Defense missing half of starting secondary after CB Ronald Darby joined S Rodney McLeod on injured reserve. … Saints coach Sean Payton’s first NFL coaching job was as QB coach with Philadelphia in 1997. He spent part of childhood in Philadelphia area and attended 1975 Flyers Stanley Cup parade. 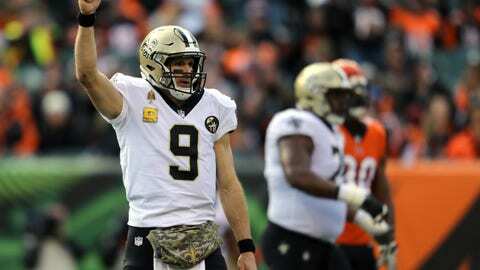 … Saints have scored at least 40 in five games this season, third team in NFL history to score 40 in five of first nine. … QB Drew Brees completed 88 percent (22 of 25) for 265 yards with three TDs, no INTs for 150.4 rating last week. … Brees has 509 career TD passes, and surpassed Brett Favre (508) for second most last week. … RB Alvin Kamara had 102 scrimmage yards (56 rushing, 46 receiving) and two TDs rushing last week. Kamara has at least two TDs in three straight outings. Kamara has scored at least two TDs in nine of 25 career games. … RB Mark Ingram had 162 scrimmage yards (104 rushing, 58 receiving) and TD catch last week. … DT Sheldon Rankins has three sacks in past three games. … CB Eli Apple had interception in Week 10, his first with Saints. … LB Alex Anzalone has sack, forced fumble and INT in past three games. … Fantasy tip: Saints WR Michael Thomas is tied for NFL lead with 78 catches, ranks second with 950 yards, and this week faces Eagles’ injury-depleted secondary.